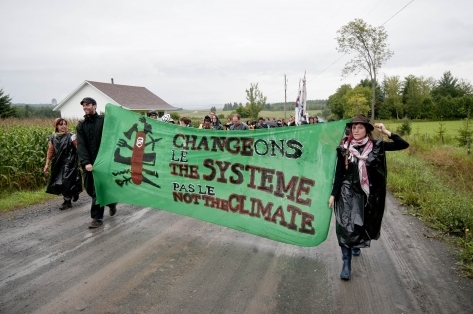 DUNHAM, QC—From August 7 to 23, the Quebec Climate Action Camp took root in Dunham, QC—an hour drive southeast of Montreal. The camp aimed to continue to build opposition to the construction of a pumping station in Dunham, a key piece of infrastructure in the Enbridge Trailbreaker project. 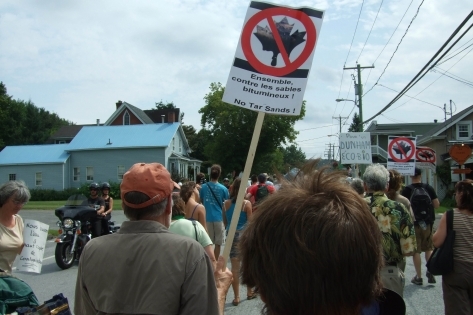 The Trailbreaker pipeline project would reverse the flow of existing pipleline infrastructure, moving tar sands oil from Alberta through the United States, Ontario, and eventually crossing through Montreal and Quebec’s Eastern Townships region. It would then be piped to Portland, Maine, to be loaded onto tankers destined for Texan refineries. Community organizers from Dunham joined the Climate Camp to build momentum in a growing local movement against the pumping station. On August 15 over 100 people marched from Parc L’Envol, down Dunham’s Rue Principal to Town Hall. Dunham Mayor Jean-Guy Demers ended the march by voicing his support for the camp and for the campaign opposing the pumping station. 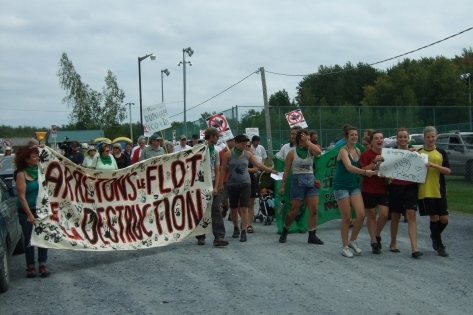 Over the two weeks of the Climate Camp, over 300 people visited the camp from across Quebec, eastern Canada, the northeastern United States and coming from as far as California and Austria. The visitors came not only to take action themselves, but also to work towards building a broad, empowering climate justice movement. The camp, powered by solar, wind and kinetic energy, was organized as an exercise in collective self-management.